A business trip to Vienna presented an opportunity to visit a new wine cellar that now ranks as one of the largest and greatest in Europe. Vienna lies in the center of Austrian wine country with producing vineyards within the city limits. There are a number of “Heurigan” or wine taverns that are reachable by public transport that only serve the establishment’s own young wines. that is home to a Michelin-rated two-star restaurant. Palais Coburg is a neo-Classical building constructed between 1840 and 1845 on top of the ancient city fortifications. After World War II, Russian troops were quartered there, and it was later occupied by the Austrian railways. It had fallen into disrepair by 1997, when it was acquired by businessman Peter Pohringer. Following three years of careful restoration, the place reopened in 2003 with 36 suites. I had reserved a 6:30 pm tour of the wine cellar. 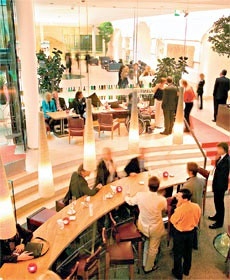 I checked in at the Coburg Wine Bistro on the first floor. I was greeted by Hartmuth Rameder, a Coburg wine bistro and cellar manager, who led me down into the fabulous labyrinth below. The collection consists of 60,000 bottles sorted into six separate wine cellars — French, Old World, New World, Champagne, yquem and rare wines — all elaborately secured with a thumbprint security system. The finish of the vast complex was a combination of old beige brick with vaulted arches, large, light beige quarry tiles and light woods. The first view of the Champagne cellar is through a circular window built into the floor above the cellar. Back in the wine bar, I perused the two Coburg wine lists while tasting a few Austrian whites served by the glass. The first wine list is the rarities book, a hardbound, inch-thick volume that provides the lineage for the many rare wines in the Coburg cellar, beginning with the oldest. Many were acquired at auction, and the book provides the acquisition information, purchase price, and detailed notes from wine experts. The oldest entry was a 1727 German Rudesheimer Apostelwein, the oldest drinkable wine in the world, which was drawn from a large cask at the Bremen Ratskeller and auctioned at Christie’s. An 1811 Chateau D’Yquem was listed at 75,000 euros and an 1864 Chateau Lafite at 16,800 euros. One of the oldest wines was from Crimea, an 1848 Massandra Muscat Lunel priced at 1,500 euros. I like to cross-check wine list prices with Moscow prices – a 2002 Kistler Chardonnay was listed (at the Coburg restaurant) at 136 euros ($210); the 2005 Kistler we tried at this month’s wine tasting cost $159 at a Moscow wine boutique, which would put it at an astronomical $450 on a Moscow restaurant wine list. My evening ended at one of the Vienna locations of Wein & Co., a chain of wine bars and wineshops. These are principally wine shops, but the wine bar provides a chance to try before buying many of the wines. Wein & Co. is a modern operation with a great selection of Austrian and imported wines, well worth a visit. Czech Airlines, SkyEurope, and Ryanair serve Bratislava airport, just 30 kilometers from Vienna. A bus runs direct to Vienna’s Sudbahnhof (south railway station) every hour for just 5.80 euros. I had a room at the K+K Palais Hotel, a boutique hotel in a small historic Imperial palace on Rudolfplatz in the northwest corner of the city center. Palais Coburg has rooms that range from 490 to 1430 euros per night. A tour of Palais Coburg’s wine cellar costs 35 euros and can be booked online at www.coburg.at. Wein & Co.’s multiple locations in Vienna are open until midnight every day.